The Glacier lagoon is considered as one of the natural wonders of Iceland. Hop on our bus and enjoy a partly guided tour to this magnificent area - on the way we stop at many interesting sites such as Reynisfjara black beach, Skogafoss and Skaftafell. 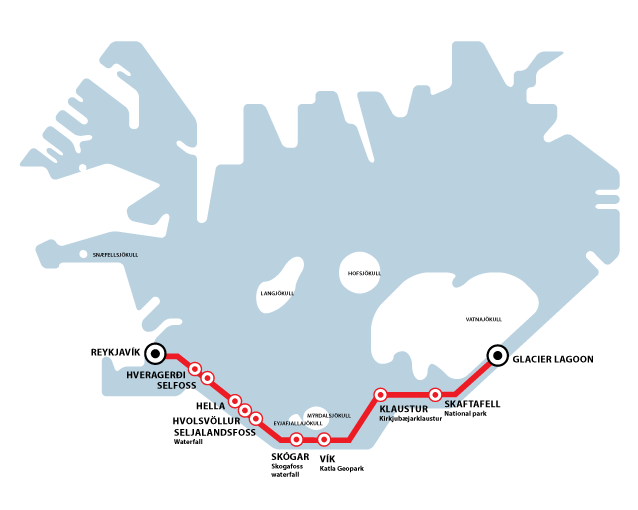 You can book a return fare to the Glacier lagoon either for one day or bring your tent and stop at your preferred sites for as long as you need. The South coast bus to Glacier lagoon departs daily from Reykjavik at the Harpa Concert Hall . Please note this is a tourist bus with scenic stops at the most visited sites. All tours must be booked on-line in advance!